When somebody mentions the Highway of Death, you probably think about a horror movie of human destruction. In reality, this couldn't be closer to the truth. The Highway of Death is a road that stretches from Iraq to Kuwait, and it was under attack back in the early 1990s during the Gulf War. Iraqi troops had invaded Kuwait and the U.S., along with several other countries, had formed a coalition that had already been authorized by the United Nations. In order to end the war and stop the Iraqis from invading Kuwait again, they were trapped on the road, and fought for 10 hours. At the end, the only thing that was left was the Highway of Death. There are different sides to the story on what really happened on the Highway of Death. Some say that there was no point in attacking the Iraqi troops, since they were already returning from Kuwait. However, others state that it was fair to start combat in order to stop them from regrouping and reinvading the neighboring country. There is no doubt that Iraq was in the wrong for wanting to take over a sovereign country; this is the main reason why the UN authorized the coalition composed by the U.S. and several other countries. The coalition decided to close off the main road where the troops would be passing by on their way back. The attack resulted in the destruction of at least 1,400 vehicles on Highway 80 and at least 400 vehicles on Highway 8. At the end of the day you could see why it was called the Highway of Death. The Highway of Death was an encounter that ended the Gulf War. The war had started on August 2, 1990 and it was being fought between Iraq and a group of 34 countries. This group was referred to as the coalition, which was recognized and authorized by the United Nations. Originally, the war had been known as Operation Desert Storm and as the Persian Gulf War. Nowadays, people refer to it simply as the Gulf War. The battle lasted for seven months, and the coalition was successful by making the Iraqi troops retreat from Kuwait. There were coalition troops deployed in Saudi Arabia, and they consisted mainly of soldiers from the U.S., the U.K, and Saudi Arabia. 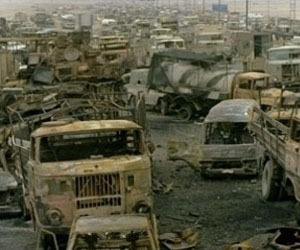 Towards the end of the conflict, coalition troops bombarded the Iraqi troops on Highway 80 and 8, which were later known as the Highway of Death and the Mile of Death. Many historians state that the coalition was critical in the success of the attacking forces. If it would have been Kuwait alone fighting off the invasion, the story would have been different. The Iraqi troops were extremely aggressive, and they were determined in claiming Kuwait as their own. Despite the fact that the coalition ended up with a Highway of Death, it helped the Kuwaiti people maintain their freedom from Saddam Hussein and his dictatorship.